Did I mention that I was building two of these tables at once? These two tables are destined to become bedside tables in management’s bedroom. (Nothing in the house is considered mine, management just permits me to use it.) I know, I know, I have a previous nightstand design that has yet to be built, but that one is now slated for another bedroom. It has rained almost everyday for the past three weeks and has made buying and transporting lumber to the house a bit of an issue. Additionally, shop time has been hard to come by. I hate it when the real world eats into my woodworking time. Anyway, after work on Friday I managed to slip off to the home center, dig out a usable board and make it back to the house before it started raining. My haul this time around is a SYP 2×12 twelve-foot long. It has a few knots and a little bit of twist, but I’m gambling that I can cull enough usable pieces to assemble the two slab tops. I’m a hand tool guy, but not a hand tool zealot and since I don’t have a handy indentured apprentice to rip this board into the required pieces, out came my old portable table saw. After a little judicious cross cutting, I put the table saw to work and ripped twenty five pieces from which to assemble the two slab tops. Twelve per slab plus one to spare. I spent a good hour arranging and then rearranging the pieces until I found a combination that would yield knot free top surfaces on the slabs. 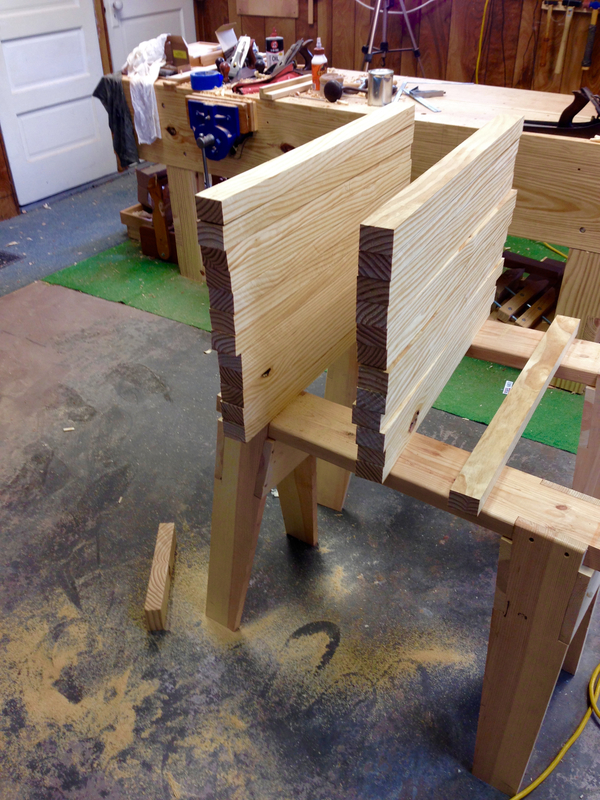 The knots are all on the lower face and located so that they will not interfere with any of the planned joinery. They are temporarily clamped so that I don’t lose track of their arrangements. I know there are a lot of you who probably think I’m crazy for using construction grade lumber, but don’t underestimate the possibilities of this inexpensive and readily available material. Even adding in a bottle of PVA glue, I will have spent less than $30US to create these two table tops. There is a lot of planing and jointing in my future. A heck of a lot! 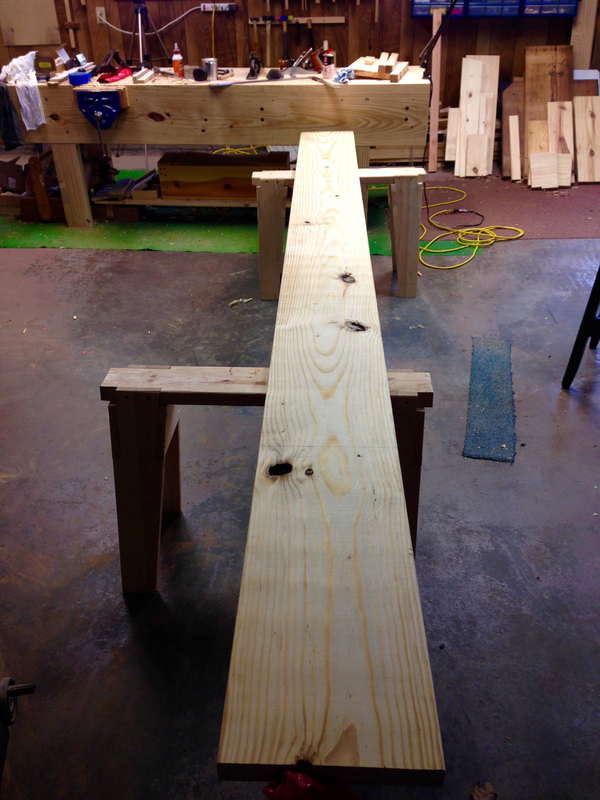 This entry was posted in Staked Side Table-000 and tagged construction lumber, slab top, SYP. Bookmark the permalink. Your drawing is absolutely fantastic! I feel like such a cave man using a sketch pad and a drafting ruler. Thanks so much! Don’t feel too bad…I’m still old school. 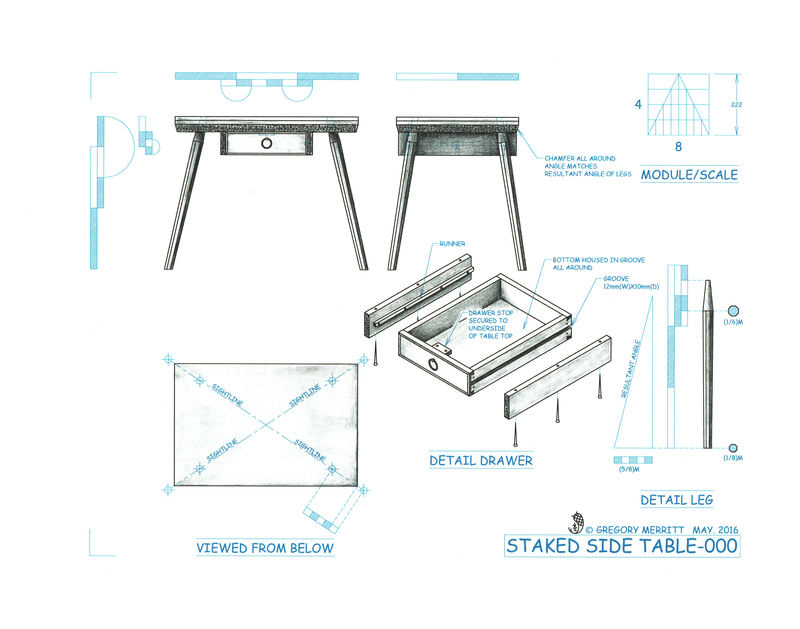 A drawing table and a few drafting tools. I’m kind on a race with you Greg… Lets see who wins…. LOL…no secret, I’ve talked about my old table saw before. Make sure to eat your Wheaties on prep work day. If you have something heavy to put on those boards it should keep it flat so you have much less planing to do. That grain pattern is very striking, looking forward to the completed tables. You will have to watch that waist line Raisin bran to Guinness to Biscuits. If I could lay my hands on timber a full 2″ thick I would probably buy it. 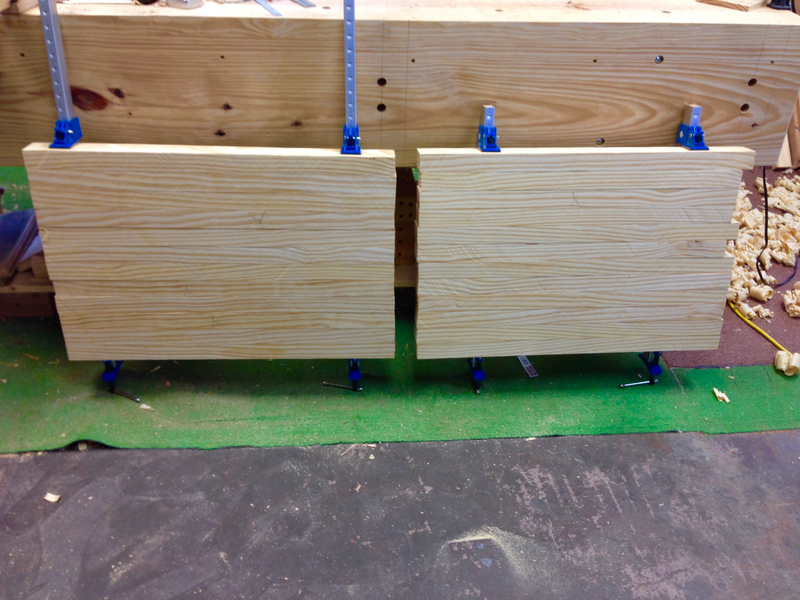 Here in the US all the 2x lumber at the home center is actually only 1-1/2″ thick. So currently this is my stop-gap solution. I’m still on the hunt for a proper lumber yard. 90 miles one way is the only option I have found so far. nice to see that someone else is using SYP for projects. Even if rough sawn Pine is available in DE, SYP is the stuff you can get pre-planed but not thicker than one inch. So I’m using it too from time to time. And I like that wild “flamy” pattern SYP has got.. Not for everyone…. Thanks to your hints, I think I’m on the way to find my sight lines. Yep…I like the SYP. It has become like an old friend and it is fun to take a humble material and turn into something useful and, IMHO, beautiful. Sight lines have to be experienced. The first time you actually use them the light goes on and all of the mystery is gone.